A breakthrough in electric torque tool technology is set to further advance the capability of electric underwater robotic vehicles, says Saab Seaeye. 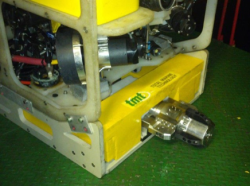 The electric underwater e-robotic systems manufacturer has collaborated with Australia-based Total Marine Technology (TMT) to launch a new lightweight electric torque tool that is smart, light, simple to fit, fast to set up, has an advanced, high accuracy torque control system and can operate across the Saab Seaeye range of e-robotic vehicles, opening up new market opportunities. 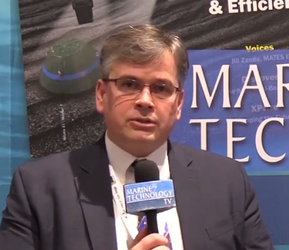 Considerable savings will come from using compact electric e-robotic vehicles and electric tooling for tasks normally performed by much larger hydraulic vehicles said Saab Seaeye, who claims no smaller electric class 1-4 torque tool exists on the market. With a singlehanded weight of 24 kilos, it is around half the weight of a typical hydraulic torque tool. The tool is able to adapt automatically to Class 1 to 4 fittings and torques while performing the integrity-critical task of opening and closing seabed valves and other torque tensioning tasks. Torque accuracy is vital for operators needing to trust a system not to damage a valve when opening and closing. Saab Seaeye said electric torque systems are far more accurate over the whole torque range when compared to hydraulic systems. Deck calibration is quick, repeatable and simpler. An electric system can provide highly accurate small torque values so is extremely useful where there is an inherent risk of damage to older valves when turned, as they may be in poor condition. The electric torque tool with its built-in drive and torque measurement is effectively self-calibrating across its full torque range. Current hydraulic torque tools operated by hydraulic vehicles are typically set and checked multiple times for a particular torque range before each dive, using a tested and certified calibration unit. Whereas in future the electric torque tool need only be calibrated by an independent body on an annual basis. Accuracy and control are standout features with the TMT torque tool as the software-managed system allows finer control and feedback than hydraulic systems. Operators control torque pressures by dialing in torque limits, speed and number of turns and watch the response on screen immediately. Pitch and roll sensors in the tool aid rapid alignment during critical tasks. In addition to opening and closing valves the tool can be used in a wide range of tasks including installation and recovery of control leads and hoses, and closing and tensioning of connectors and bolts. 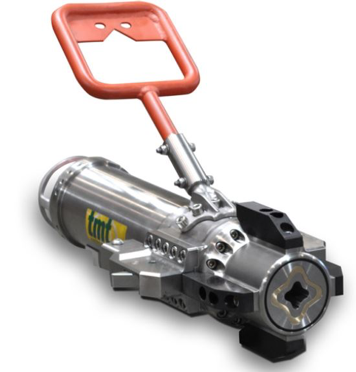 A typical hydraulic torque tool weighing around 50 kilos is generally held out in front of a vehicle by a heavy-duty manipulator, so needs a large vehicle. As the TMT tool is half the weight it can be fitted to a smaller robotic work vehicle such as the Saab Seaeye Leopard - and can even be underslung to operate from an even smaller robotic system such as the Tiger. While on an inspection mission a compact electric vehicle can intervene to operate a valve, thereby avoiding follow-up intervention and reducing the number of excursions. This development demonstrates how electric underwater e-robotics are increasingly undertaking serious intervention work as the market trends towards an all-electric future. Both Saab Seaeye and TMT see their collaboration as the start of a jointly beneficial relationship, with Saab Seaeye marketing the tool exclusively in the Northern Hemisphere and TMT in the Southern Hemisphere.